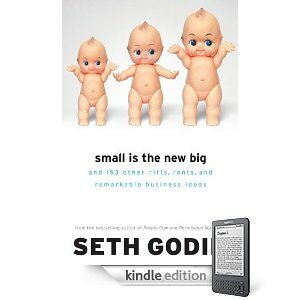 Seth Godin: Small is the New Big…this works for me. Last Thursday I hit the road, yet again…and, as usual, armed with my phone/charger (for the obvious), tape recorder/fresh tapes, for my “audio journal”, and a handful of books on CD, to catch my reading time. With this on hand, it amazes even me, how fast a full day, never more than 12 hours, of driving can pass. More than just a "good read"...a MUST read. As the impetus of this trip was to get to NC to prepare the warehouse/showroom for the semi annual High Point Furniture Market , followed by Market itself, I like to find CD books that “spur me on” to that dream I am following…AND, Seth Godins’ Small is the New Big’ did just that. Without going into a full out review, let me entice anyone who feels that they might be wondering about putting themselves out on a limb, whether or not to do that…well, if you had any doubts, reading this will surely quell those, and in fact will assure you that you are most definitely on a track that will serve you, and others, well. As I get closer to the introduction of ZAAR Design Center becoming a reality, following all online intros prefaced, I am feeling more and more that the uncertainty/uneasiness and “fear” are all worth combating, and necesssary feelings to have, to follow your heart and do what you feel you need/can do to contribute to the greater good, striving to be no less than Remarkable. Thank you to my dear friend, and customer, Sylvia Muller/proprietor of The Mill House Inn, for introducing me to Seth, his blog, and subsequently to his books. Thank you to the Auburn Public Library, for having this book in stock at the time I was looking for something for my current road trip. P.S. Tell you another thing. IF I had disappointed myself in NOT pushing forward with my “grand plans” my feelings following reading of this particular missive would’ve been more of “dumb me…I KNEW I should’ve bitten the bullet”….so nice to have such acknowledgment/support and FEEL like you have someone like Seth in your corner, spurring you on…. click image to be taken directly to Amazon to purchase your own version…or do as I did and rent the audio version from your library for $1.00/2 weeks…. Well, good morning to you my friend! Yes, feel like I’ve been in a cave, not having him as part of my daily dose of moving me towards “get out there and do it” input. Been getting his blog for a week or so now…like that it is to the point, consistent, and well, spurs me on….as you said, action oriented. We’re here to inspire each other right? Thank YOU for being such a friend…we MUST get together when I’m back in New England…which will be early Nov.
Hope this finds you well….update me when you have a sec. Thanks Ruth – I’ve been SethFan for a while now and this one sounds great. His daily nuggets are always inspiring for new ideas and reflection, and…Action!. Thanks for your post. Talk about inspiring…that’s You!